A CCJ check online can be performed by any member of the public. The register of judgements carries details of everyone that has been issued with a County Court Judgement and their details will remain on the register for six years. If they have paid the CCJ then this will be notified on the register, but it will still stay there for six years. A CCJ check online usually involves paying a small fee, and this is somewhere between £6 and £10. You may want to look at the register to see if an old judgement has been removed because your credit score is not as high as you thought it was. People often need this information if they are interested in a credit score for renting property or they need to take out a loan of some kind. It could be that a potential employer performs a credit check to see whether you are a suitable candidate for a position within their company and this could involve a County Court Judgement check. Likewise, any potential landlord might want to conduct a CCJ check online to see if their new prospective tenant has any CCJs. Part of the requirements of this is that your name will go on a log known as the register of judgements. This log is available to any member of the public and it will show that you have failed to keep to your financial agreements to the point where the courts have had to step in and take control. Anyone conducting a CCJ check online will be able to see your name and this can be highly embarrassing for some people whereas others are not concerned by it. You must be aware that your name will enter this register and remain there for up to six years. If you find yourself in this position, you could try and clean up your credit file to improve your score. This would make it easier for you to get a mortgage or borrow money in the future. Most people in this position want to know how long does a CCJ last for? This is very much down to the courts to decide and a lot of it will have to do with how much money you owe. Each person’s financial situation is completely unique and so the length of time that a CCJ is paid back over reflects this. Once a CCJ has been approved, the courts will send you the details in the form of a letter and it will state how much is owed and how long the debt needs to be paid for. Regardless of whether you pay it off early or not, the order will still appear on the judgements register for six years and therefore could negatively affect your credit score for this length of time. The only exception to this rule is if you pay the CCJ in full within one month of it being actioned. In this scenario, you can apply to have your name removed from. This usually costs £15 but if you are on a low income then you may not be charged this amount. It’s a good idea to check your own financial history and see if there are any outstanding debts which could be affecting it. Have a look at our CreditReport.co.uk site review to see details on one of the online services. How Much does a CCJ Affect your Credit Rating? A CCJ may not seem like a big deal but it can adversely have a damaging effect on your credit score. How much does a CCJ affect your credit rating? Well, that depends on how quickly you pay for it. An order like this is seen as a breach of financial trust, so any potential lender will think twice about loaning you money if they see you have an order against you. Your details will appear on the register of judgements for six years and can therefore damage your credit rating for this length of time. You may find it very hard to apply for further credit while this is still active on your report, but if you do pass you will find that the rates and terms and conditions are not nearly as attractive as they were before the judgement. Often mortgage credit reports are carried out to determine your financial history. Having a poor score can affect your chances of being accepted. The only way a CCJ would not impact your rating severely is if you pay it off within the first month. You can apply for the order to be removed within the first month of it being issued and this should not damage the rating. The process of how to clear a CCJ from a credit file can be undertaken on two levels; at the beginning of the term and after it has ended. If you pay it within the first month, you can use an N443 application form to apply to the courts to have your details removed from the register. This happens relatively quickly and there is little-to-no cost involved. After one month the order stays on the register of judgements and your file for six years and there is no way to remove it sooner. You can apply for a ‘Certificate of Satisfaction,’ which is the same process as applying to have your details removed within the first month. The difference here is that this will just show prospective lenders that you have paid the debt – it will not remove it before the six-year period has ended. 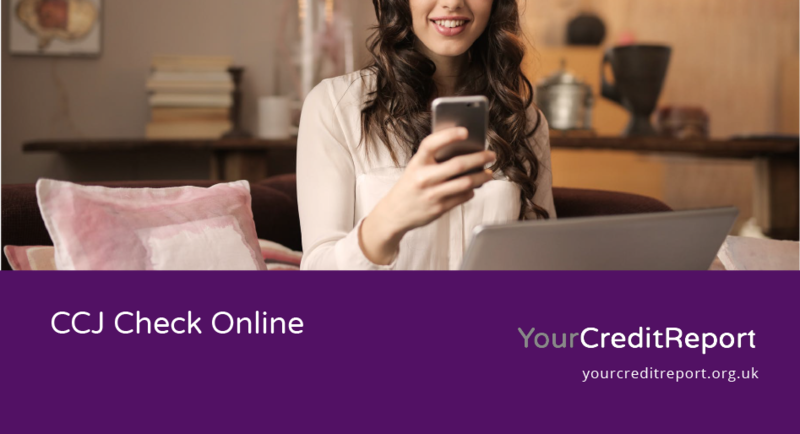 Make sure to check for yourself by using a service like Credit Angel online which displays your file for you. The other way to clear CCJs from a credit file comes after the six years has elapsed. Technically it should just fall off the credit report after six years but if it doesn’t you can write to the reporting agencies to have it removed. There should be no charge involved in this process. A County Court Judgement search can be accessed by anyone because it is a public document. This can include yourself, potential employers and landlords, and anyone carrying out a credit check on you. It can also include friends, family members and people that you may have had disagreements with in the past. It will include personal information such as your name and address as well as showing that you have had severe financial issues and the amount of money involved. The unfortunate side to a CCJ check online is that literally anyone can see that you have had CCJs brought against you and it can be embarrassing. Another popular company which allows you to see your financial history for yourself is the Check My File site which we have also reviewed here. The Registry Trust limited website is where you can search for details of a CCJ being appointed. There may be a small charge involved for accessing this information but if you want to look at your own details on the CCJ register using a free search then you may have to be a little bit crafty. The three big credit reporting agencies, all have offers where you can look at your credit report free of charge for a limited time. By signing up to one or all of these services you will be able to find out if a County Court Judgement is attached to your file. Just be sure to cancel the subscription if you don’t want to use it at a later date. If you want to view someone else’s details for free then this may not be possible. An Experian credit report will document any CCJs that are attached to your credit file, even ones that may be incorrect. It could be that a judgement has been applied to the file through a simple clerical error, but all the time that it is on there it is damaging your credit rating. Experian have a 30-day trial offer that lets you explore their full service. After the 30 days have expired you can continue to receive your credit score for free but not the full report. You can choose to carry on with the service but there is a monthly charge involved. If you discover that there is a CCJ attached to your credit file that you do not recognise then you must contact Experian as soon as possible to have it removed. You can learn more about credit scores if you are unsure of how they will affect you financially. As with all credit referencing agencies, Equifax should remove any CCJs from your file once they have been satisfied. After the six-year time period has elapsed the order should naturally come off your credit file, but credit reports can have a three-month delay on them. If you want to challenge Equifax as to why it is still showing on your report you should allow for this time discrepancy. Once the order has been completed and the trace of it is removed from your credit report, you should find that you in time your credit score will start to rebuild itself and you will find applying for credit will become easier too.